We've all heard that saying, "it's like shooting fish in a barrel" to represent a task that's easy and undemanding. However, not many of those people have actually tried to shoot fish in a barrel, whether or not that is due to PETA and the like who knows. Here I present you with a rather simple game, but one of those games that is tirelessly addicting such as snake, Tetris, or brick breaker. It is bold to place "Fish in a Barrel" among such canonical games but once you've played for yourself it will be hard to disagree. 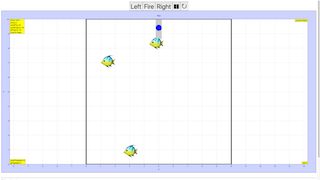 You may select the number of fish once the program is running, however changing this will reset the game. Also note that a larger number of fish than the original number cannot be selected due to the nature of an Array. Click anywhere in the display window to play the game. Aim your harpoon gun using the right and left arrow keys. Last, but certainly not least, let loose a harpoon with a simple tap of the spacebar. Refer to the PDF readME file for "Fish in a Barrel" for more information on the game you can't stop playing.